Peter Packrat was the second and probably the rarest of the system 1 games. It was released in 1985? and in this game you play the role of a packrat who must collect various objects located throughout the level and return them to the nest. While this game may look like a kids game at first, it is really difficult. 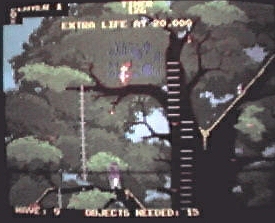 Even though this wasn't the most popular of the system games, it is still fun to play and the music is pretty cool too!